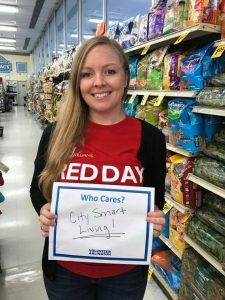 Red Day Was in FULL Effect for the City Smart Living Team! 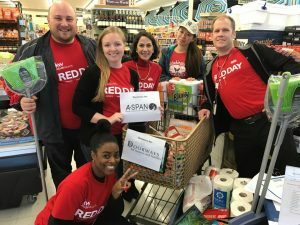 Red Day is an annual event at Keller Williams Realty, where teams or individual agents volunteer at various locations. The freezing, pouring rain couldn’t even stop City Smart Living from giving back to their community. Everyone grabbed their coats and headed to their Red Day location; Safeway 5101 Wilson Blvd, Arlington, VA 22205. They were to greet shoppers and inform them about the A-SPAN and Doorways charity groups. 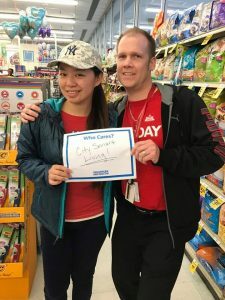 Shoppers were given the chance to support by purchasing items off of a sheet given to them and dropping the items off on their way out. A-SPAN and Doorways support the homeless, abandon families, and women in domestic violence situations. So every item made a difference. The products ranged from feminine & household products to gift cards to various locations. The team more than exceeded their goal in what they were able to gather from the shoppers. It was truly because each team member approached the customers with sincere hearts and excitement about the cause. Red Day was about giving back, but for this team it was an honor just to be apart of it!